As we transition to a global, knowledge-based economy that is often driven by information technology and innovation, it is increasingly important that STEM workforce preparation includes a strong foundation in computing. Thus, the STEM-C Partnerships project addresses both the need for advances in K-12 STEM education generally, as well as the need to elevate the inclusion of computer science education. The STEM-C Partnership adds a discipline-specific focal area on the teaching and learning of computing and computational thinking, a strong commitment to broadening participation in computing, an emphasis on in-service teacher professional development, and support for the implementation of computer science courses at the high school level. Idenitfying methods to create formative low-stakes rubrics for novice BJC teachers. 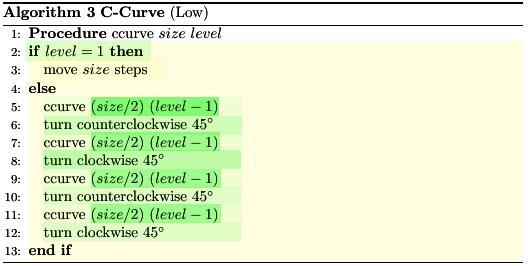 Research spanned ITS and Autograder methods to Delphi and Nominal Group techniques. A new validated framework using the Wheel of Compentecy Assessment was developed. 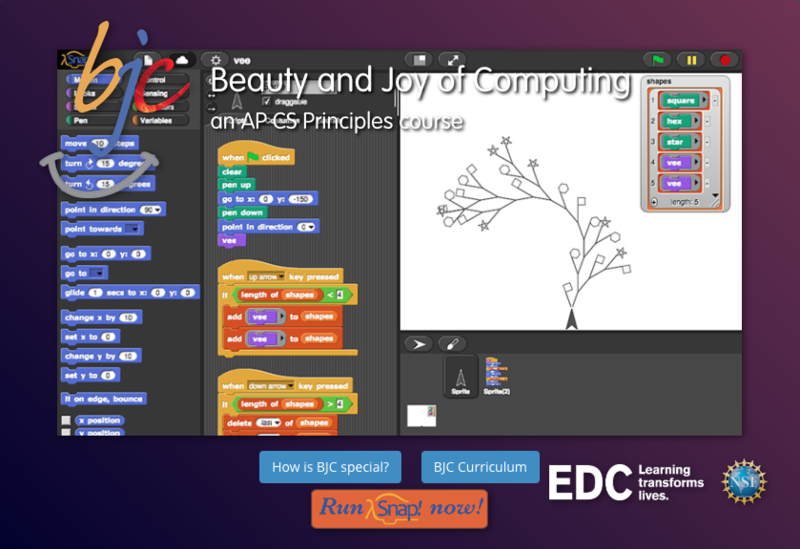 The Beauty and Joy of Computing (BJC) is an introductory computer science curriculum piloted for the AP CS Principles course being developed by the College Board and the National Science Foundation. It focuses on some of the "Big Ideas" of computing, such as abstraction, design, recursion, concurrency, simulations, and the limits of computation. This course shows beautiful applications of computing that have changed the world, talks about the history of computing, and where it will go in the future. My research with this project revolves around teacher support and professional development. Unlike other AP courses where a teacher might have years of experience in that subject, AP CS Principles teachers tend to have a much smaller experience or background in the matter. My work centers on developing curricular support materials enabling HS teachers to understand the learning competencies students should gain, and how to understand evidence of such in programming artifacts produced by students. 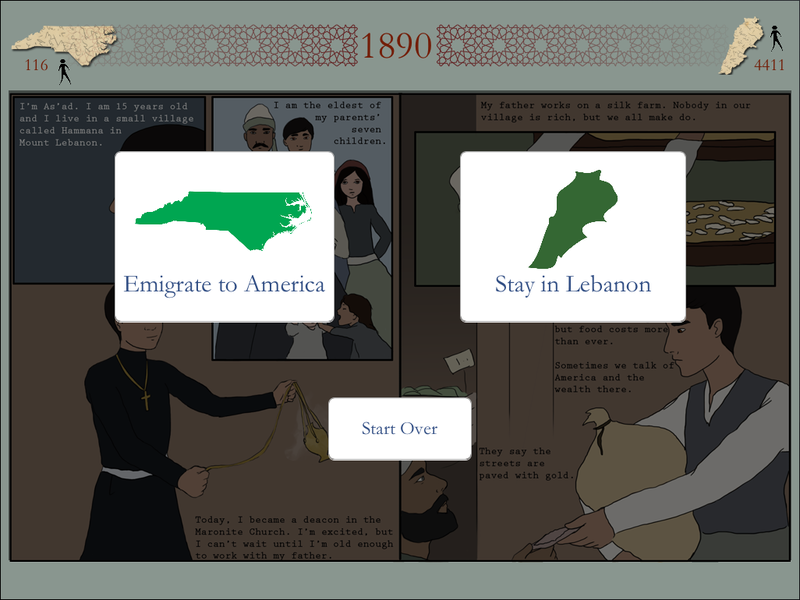 Journey and Belonging are games developed in collaboration with the Khayrallah Program for Lebanese-American Studies, detailing the experience of Lebanese immigrants to North Carolina. Each game features several characters spanning various time periods, whose stories show how the experience for immigrants has changed throughout history. 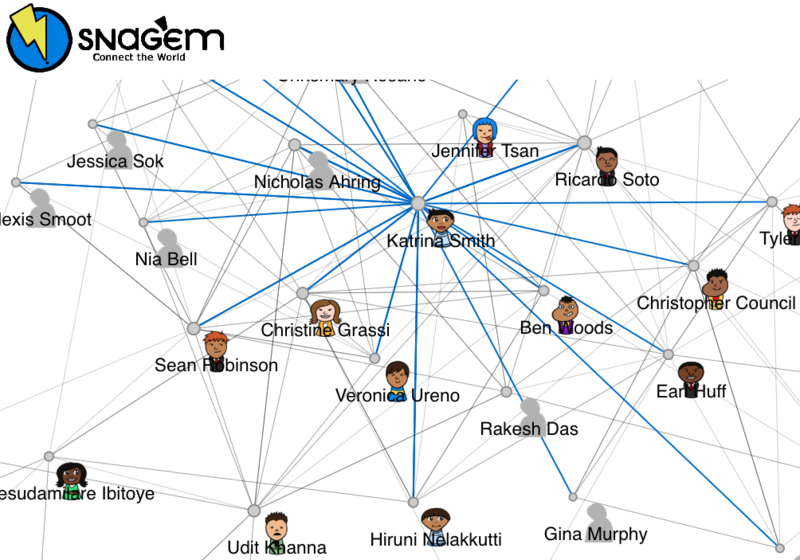 Snag'em is a large group networking game that is essentially a human scavenger hunt. Snag'em is a web-based game using that allows players to create their online profile and forge connections with other users. In this social networking game, players create a list of facts about themselves, called tags, which are then randomly presented to other players as missions. Missions are presented in the format,SNAG someone who works in the Game2Learn lab, and can only be completed by interacting with a person who fit this qualification. This game is particularly effective for fostering connections between first time conference goers and undergrads. 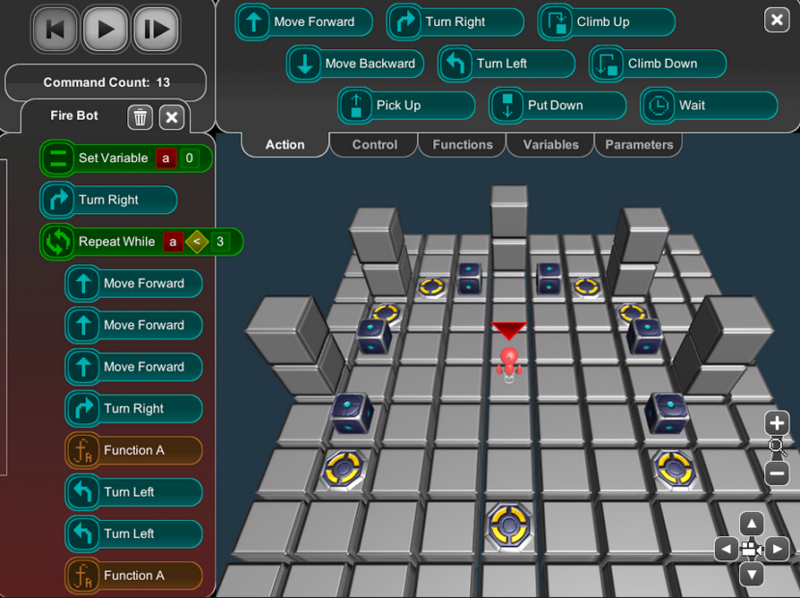 BOTS is a programming puzzle game designed to teach fundamental concepts of coding to novice programmers. In the game, players write code in a drag-and-drop programming language. The object of the game is to move a robot around mazes, solving puzzles and clearing obstacles. Our research focus is on how player-generated content can be used in educational games. With BOTS, we are testing several different designs for level creation tools to see which results in the highest quality levels and the best experience for the creators. The combined hardships of economic downturn and a target audience that is increasingly defined by their affinity for active participation in their surroundings have left many nonprofit museums struggling to remain relevant in the 21st Century. 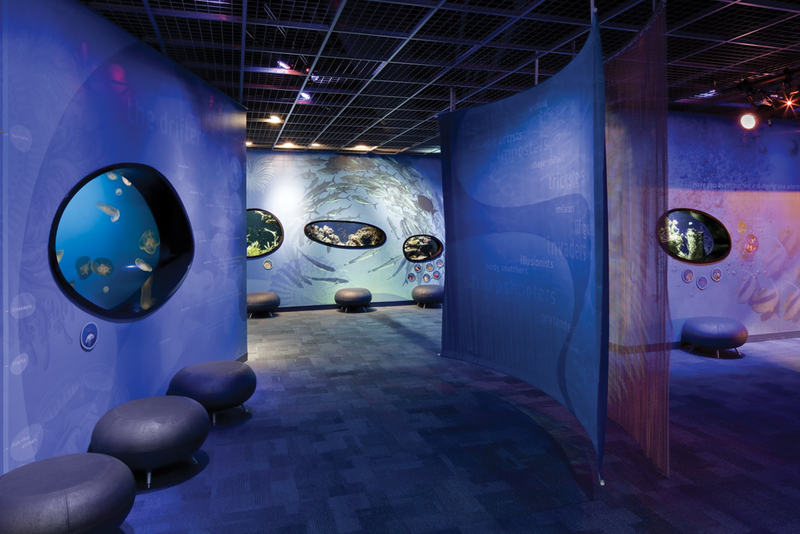 We have partnered with Discovery Place, a hands-on science museum in Charlotte, North Carolina in order to create an easy-to-integrate software solution to help them better engage their audience. Our project is the creation of a three-part digital layer to increase museum engagement for all visitors, but particularly those considered digital natives. We have created two systems to be implemented in the museum, one to appeal to traditional visitors and one to better engage large groups of students. In the future, these two systems will be tied to an online meta-game to complete our digital layer by bringing the enhanced museum experience home for visitors.